By buying this product you can collect up to 462 Yachtaid Points. Your cart will total 462 points that will be converted into a voucher towards your next purchase! Must be logged in to collect points. The Emerald TurboVap series of split-gas evaporators for boats incorporates revolutionary design features with mechanical engineering that maximizes the effectiveness of R-410A, an environmentally safe refrigerant. Emerald TurboVaps are easy to install. For ideal positioning, the high-velocity blower can rotate up to 270 degrees with a single adjustment screw. The enclosed motor means no blower-motor overhang for a compact design. Since evaporators are usually positioned in or near cabins, noise is always a concern. The Emerald TurboVap uses a vibration-isolation mounting system to minimize noise, so the evaporator runs more quietly. 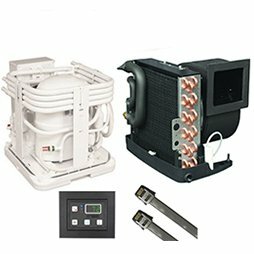 The fully insulated, high-velocity blowers are quiet and efficient. Excellent condensate drainage is achieved with a unique positive-flow, anti-slosh, composite drain pan that is rust-free. Condensate water is rapidly removed at one of two easy-to-plumb drain locations. The Emerald TurboVap Series was designed to operate as a system with the Emerald Condenser Series. Both of these split-system components were engineered to harness and maximize the superior thermodynamic properties of the environmentally safe R-410A refrigerant.